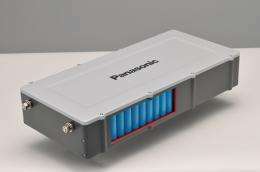 Panasonic Corp. has developed a 1.5 kWh battery module from 18650-type (18 mm in diameter x 65 mm in length) lithium-ion battery cells, which are widely used in laptop computers, to provide energy storage solutions for a wide range of environmentally friendly energy technologies. For example, multiple units can be connected in series and/or parallel to store energy generated by home-use photovoltaic (PV) systems and fuel cells, and power electric vehicles (EV). A prototype of the new module will be shown at CEATEC JAPAN 2009 (Makuhari Messe, October 6-10, 2009) and New Energy Industry Fair Osaka (Intex Osaka, October 7-9, 2009). Amid rising environmental concerns such as CO2 emissions, great expectations are placed on widespread use of renewable energy technologies such as photovoltaics and commercialization of electric vehicles to alleviate the concerns. However, these technologies require storage systems to become commonplace in daily life. Among a number of energy storage technologies, storage systems using lithium-ion batteries in particular are considered promising and practical, because such systems are lighter and have greater capacity than those using other types of rechargeable batteries. As applications of the storage systems using lithium-ion batteries increase, there will arise demand for such systems with higher capacity, output, reliability and safety as well as improved cost performance. Flexibility in voltage and capacity will also be required according to the application. Panasonic's compact and high-energy battery module meets such demands. The module having a volume of approximately 7 L and weighing 8 kg has a voltage of 25.2 V and a capacity of 58 Ah. By connecting a plurality of this module, users can construct battery packs for a variety of applications such as home electricity storage and electric vehicles. The high-energy module is constructed from 140 pieces of 18650-type lithium-ion battery cells - seven serially connected rows with each row made of 20 parallel connected battery cells. This structure allows for avoiding serious loss in the system performance such as system shutdown even if some individual cells fail. Panasonic has a proven record in the production of the 18650-type lithium-ion batteries which are highly reliable and safe, and offer good cost performance. The company has already developed and commercialized a 18650-type lithium-ion battery which has the industry's highest level of capacity. To achieve the innovative module, Panasonic employed a high-capacity and high-durability cell technology using its proprietary nickel-based positive electrode material. Other technologies used include its cell safety technology that uses a heat-resistant insulating layer between the positive and negative electrodes to prevent short circuits and thermal runaway (overheating) which can be caused when foreign particles get mixed into the battery cell. The new module also uses Panasonic's design technology to ensure reliability by minimizing the effects on power supply if a trouble occurs in some of the cells contained in the module. On the new battery module, Panasonic holds 38 patents in Japan and 22 in other countries including pending applications. Put this article together with a news item out today and it sounds like things have improved for EVs. "Japan's Panasonic Corp (6752.T) said on Thursday it has developed a technology that binds together standard lithium-ion battery cells used in laptop PCs to power electric vehicles, taking aim at growing demand for green cars. The new technology will likely enable Panasonic to make electric car batteries at half the cost of lithium-ion batteries that are developed solely for electric cars, since it can use existing battery plants and production expertise, the company said."